Rara Lake Trekking in Nepal is located at an altitude of 3000 meter, in mid-western region of Nepal. Mystical Rara Lake is recognized as a queen of opera as it offers the brilliant scenery of lake, a range of mountains, high hill station, lush green forest, vegetation, and landscapes. The Rara is the biggest and deepest freshwater lake in Nepal Himalaya and is uncrowded trekking routes can conduct the journey either from Jumla or directly flying to Talcha airport. Beautiful Rara Lake provides an excellent exploration opportunity in an untouched and wild region protected under the Rara National Park. Considered to be an off the beaten path trek destination of Nepal, Rara lake trek is said to be the most popular trekked area of western Nepal. Trek from Jumla to Rara Lake itinerary is designed to focus for those beginner trekkers who have little time on their visiting Nepal. The trail takes you through a fascinating traditional mixed ethnic group and their villages who will greet you with warm hospitality. Rara lake trek is a wilderness exploration in Nepal and possible to do any time throughout the year. An express trek to Rara Lake compared to most walks in this region is designed for world travelers who wish to hike into the wild west of Nepal but are walking with limited time wise than taking this special short itinerary. 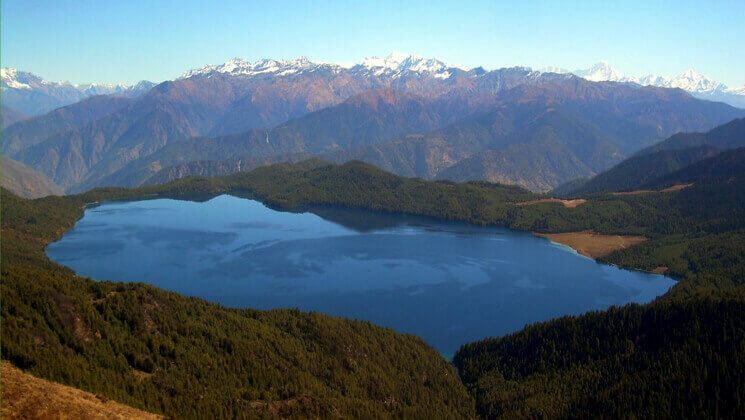 However for travelers who wish to reach rara lake in a more relaxed manner but if you wish to commence this trip from Jumla than request us for tailor-made itinerary. Day 2 Kathmandu city – World Heritage sites (1,348m) sightseeing, 6 hours. Day 3Kathmandu to Nepalganj city flight. Transfer to your hotel. We take an hour flight from Kathmandu to Nepalgunj city of west Nepal. Nepalgunj is a big town is also a gateway to Simikot of Humla. The town itself is an interesting Terai town of Nepal with influences from both the Nepal hills and plains well as local Hindu & Muslim cultures. Get experience visiting some sightseeing places in Nepalgunj with our guide. We prepare for your tomorrow’s flight to Talcha Airport. After breakfast at Nepalgunj, we fly to Talcha airport. Talcha airstrips located at an altitude of 2735m above sea level. As we are landing in Talcha, we organized our trekking gears and began our journey to Rara lake. The easy journey goes through the beautiful forested region and we get to witness the cultural delights of rural Nepal, which are extremely unique and fascinating. As we arrive on Rara lakeside, you can do the boat ride to explore birds, corners of lakes, mountains and herbal plants etc.. on the most pristine lake of a widespread lake is a fascinating experience. Overnight in camp at Rara Lake. Day 5Exploration day on Rara Lake ! Today is the main day to explore around of lakes. We ascend roughly about 2 hours up the Chuchemara Hill which is located at an altitude of 4090m. From this hill, you can get almost the best view to exploring Rara in all sides. On the north direction, you can see some white mountains backdrop to Rara Lake and lush vegetation of Rara National Park. You can also see the beautiful green hills in the middle of stunning Rara Lake, and on your down, you could see the mesmerizing view of the lake itself. After Chhuchemara hill station hiking, we begin to explore around the nearby vicinity. Than we return to our camps for the overnight stay. Day 6Rara to Talcha trekking. And fly back to Nepalgunj city. Today, we trek back along the retracing trail to Talcha airstrips. Do not forget to look back and around for the last view of Queen of opera means the queen of Rara lake. On our arrival to Talcha airstrips, we fly with 18 seater twin otter aircraft to Nepalgunj city. On our arrival in Nepalgunj city, we, are transferred to our hotel. Day 7Fly back to to Kathmandu. After breakfast in the morning, we fly back to Kathmandu city. Upon arrival in Kathmandu, you will be transferred to your hotel. You can spend the evening leisurely, perhaps catch up on some last minute shopping and celebrate dinner together with us. Overnight at Kathmandu..
How much does Rara Lake Trekking cost? Hike to Rara lake trip is available now on USD 950 per person is standard trek price on double occupancy basis but if you are traveling into the luxury style, then let us know for better service. In this price, we offer you Tourist Standard accommodation in Thamel, Kathmandu and tourist standard accommodation in Nepaljung airport and of course, the trip price will vary according to group size. AND WE ARE OPEN TO CUSTOMIZE YOUR TOUR AND PACKAGES PRICE AS PER YOUR REQUIREMENTS. International tour leaders are highly encouraged to get discount and attractive complimentary. 2 nights Tourist standard accommodation in Kathmandu within Bed with Breakfast Plan. Domestic flights: Kathmandu – Nepalgunj – Talcha- Nepalgunj – Kathmandu as a round trip airfare with airport departure taxes. Kathmandu and Nepalgunj domestic airport transfer . We can organize private Rara lake Trek starting at any date that works for you. Please contact us for more information. Question: Do I need experience to do Rara Lake Trekking? Question: What kind of accommodation can I expect on Rara lake trekking? Answer: We provide you tourist standard accommodation in Kathmandu and available local lodges on trekking. Room along the routes are clean with a cozy bed with a nice mattress and blankets. However we recommend you to take your own sleeping bags if you have one with you otherwise, you may rent it while you are in Kathmandu. Question: What kind of food can I expect in this Rara Lake Trekking? Question: What opportunities will I have for a shower along Rara Lake Trek? Answer: All the lodges they have a shower which you can get it on pay and somewhere without paying however if you are in camping trekking – we provide you hot water bucket then you will take a bucket shower. Question: How do I get drinking water on Rara Lake Trekking? Answer: Most of the places, you can buy bottled mineral water to drink but we advise against buying mineral water in plastic bottles, as currently there are no provisions for disposing of these. Instead, we provide you with boiled water or bringing chlorine tablets to purify the normal water as the normal water is available in campsite/along the way. Question: Is there any communication facilities on Rara Lake Trekking? Question: Can I use credit cards in Rara Lake Trekking? Answer: No! You need to have cash Nepali rupees along with you to maintain your daily expenses because credit cards work only in the bigger cities. Question: Who will carry my luggage on express Rara Lake Trekking? Question: Do I need walking polls for lodge style Rara Lake Trek ? Answer: You can allocate US$ 08 – 10 for a lunch/dinner in Kathmandu and it depends on your spending habits. US$ 7 to 10 US$ each day will be enough to buy bottles of water, chocolates, tea coffee, and some drinks while you are on Rara Lake Trek. Discover far western Himalayas and experienced the uncrowded trail to get Rara lake. Walking through cultivated fields, excellent views of Rara lake and its surrounding. Experience the mixed ethnic groups people of Nepal and their culture and tradition. Opportunities for challenging trekking or hiking and pleasant strolls are scattered all over this planet; you just need to know where to find them. We believe in the quality of services. Your safety and satisfaction is our concern. We are a team of professional, experienced, well trained and licensed local guides who know the destination much better than others. Moreover, we give benefits to the local communities and helps to conserve natural resources which reduced costs and consumption. Finally…. we did our trekking to Rara lake Trekking. It has long flight journey for us, and its really worthy…. to see spectacular view all the way and beautiful rara lake.